WE ARE told that Alex Bennett who died in the boat fire at Stone is a sad loss indeed. Alex was a fun loving and friendly woman, well known to many boaters, and will be a loss to the boating community. She was the owner of the historic traditional narrowboat Tench and regularly attended the Historic Boat Festival at Alvecote on the Coventry canal where she was well known and respected by other boaters, having many friends. Her boat was used in the 'Idle Women' reconstruction trip that took place last year. The narrowboat in which she died was not Tench, but one she was using as her home. 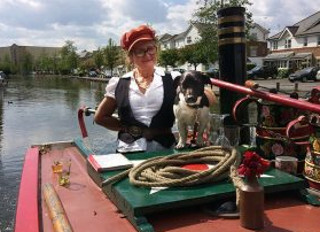 The picture shows Alex and her dog on Tench.